Having a construction site at your school is a big deal, even out of school term time. 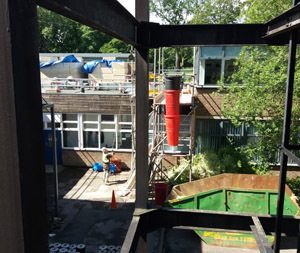 In another post about our live school roof refurbishment project, we look at how the school construction site has been set up and talk to Nigel Aveyard of Arcadis about the Health and Safety arrangements. On our Academy site in West Yorkshire, Arcadis are acting as Construction Assurance Advisor, as well as being Principal Designer. 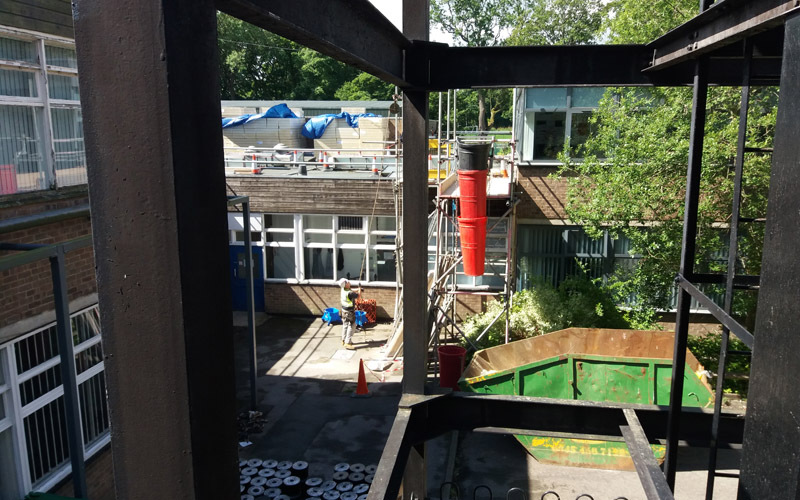 As CAA, Arcadis ensures that the school meets all its obligations as Client, including carrying out site inspections and monitoring the school construction site to ensure it is being run safely. Make sure you have the advice and assurance (and the legal protection) that you need when a construction project is being carried out on your school. A key aspect of the CDM Regs is to ensure that there is clear communication between everyone working on the project. A key CDM document is the Construction Phase Plan, which the contractor produces to show all aspects of how they are going to do the work. This plan, which must be agreed by the team, covers the programme and work stages, welfare facilities and operational arrangements, communications arrangements and how all risks are going to be managed. Our Academy site in our West Yorkshire has been set up using an isolated car park at the top of the school, out of the way. This provides the best option for the continued operation of school during the holidays, whilst complying with health and safety requirements, A single storey bungalow in this area is being used as the site welfare and office. The contractor also produces a Site Construction Traffic Management Plan which lays out the access and egress points from the site, where materials will be stored, and how people and machinery can use the site safely, maintaining a separation between them and from other hazards. In this photograph, you can see one of the roofing contractor’s workmen working on setting up the site. He’s wearing hard hat, high visibility clothing and protective boots. Whilst erecting the scaffolding he’d also be wearing a safety harness. Roofers will also wear a harness when over high areas which are additionally protected by netting. Safety netting is being installed internally in the main hall, so that if a worker does fall through the roof the netting will break their fall. The netting also protects against falling debris. At our Academy site, a full handrail scaffold will be built around the whole working area, with gated access and a self-closing hinge. Access is by a properly secured ladder. All the scaffolding is tested weekly and entered into a register which can be inspected by the Construction Assurance Advisor on behalf of the client. 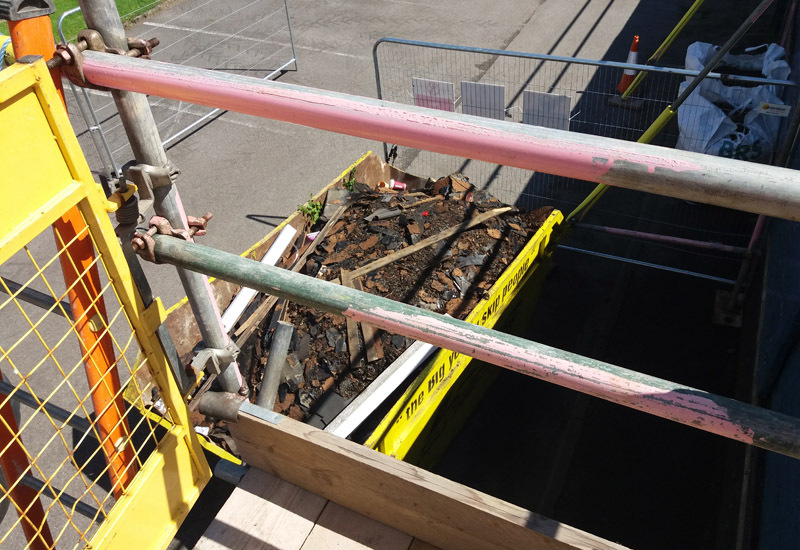 The contractor in the photograph is setting up a safe access route between the existing rooflights to give workers a safe walking route to roofs 1, 2 and 3. All rooflights will be fragile and if people fall on them they are very likely to fall to their deaths; rooflights should be demarcated by a separate handrail or covered over (for example, with wooden box work). If people are working underneath them they should have safety nets underneath and a barrier underneath to prevent people from going near. Deliveries of materials to the site are an important aspect of the job, from both a logistical and Health and Safety perspective. The Construction Phase Plan covers deliveries, which will be co-ordinated so as not to interfere with the operation of the school. 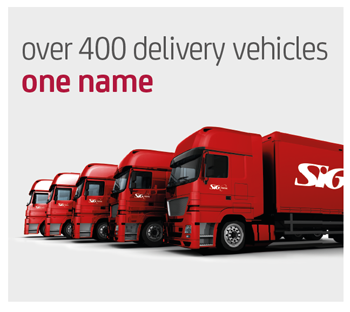 SIG Roofing is the largest supplier of roofing materials in the UK – you may have seen our red lorries. Using the SIG network of 120 UK branches, we have the flexibility to store materials at the depot or to deliver to site, depending on the needs of the school. In this way, any challenges to storage space, to the safety of students and staff, or to security of materials can be addressed efficiently as part of the Construction Phase Plan. The photographs here were taken on the first day on site, and some materials have been delivered but are not yet in storage. All the materials will be stored either indoors (including in the container the contractor has provided), or securely, off the ground under tarpaulins. 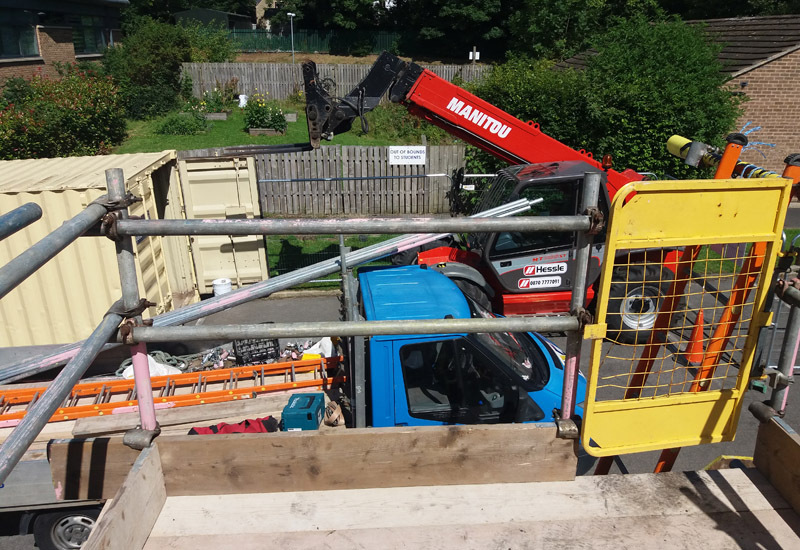 You can also see an industrial fork lift, which is used for lifting materials onto the roofs. Manual Handling is an important Health and Safety Issue, Nigel explains. To avoid injury to human workers, machinery is used to move around materials wherever possible. The skip in the photographs contains about a quarter of just one of the four roofs we’ll be stripping. There is a lot of material to get off the roof, so it is important that it is handled efficiently. Full skips are removed by a licenced waste contractor. We segregate our waste and try to limit the amount of waste to landfill. The skips are sent to a licenced waste depot which will sort the waste to identify products for reuse and recycling. If you’re having your roof replaced, you should expect this sort of attention to detail, procedure and health and safety. Make sure you ask about how your health and safety obligations will be met, and check out any suppliers’ credentials and experience. The first roof the contractors, Roofclad Systems, will be working on is the Boiler Room roof, which will be completed first so that new boilers can be fitted inside. We’ll be covering this part of the project in our next post. If you have any questions, do get in touch or ask them in the comments. Find out more about the Academy School Roof project here.